Seattle - Pellet exports from the two primary pellet-producing regions on the North American continent – the US South and British Columbia – showed no signs of slowing in early 2013, with the rate of growth likely to accelerate in the second half of the year. In the US South, pellet export volumes to Europe resumed their double-digit growth after a brief pause in the 4Q/12. 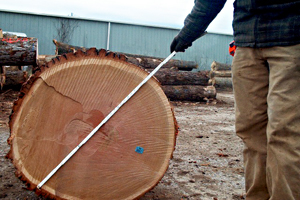 Export volumes, based on information from industry sources as well as trade data in Europe and North America, showed exports in excess of 1.7 million tons in 2012, as reported in the North American Wood Fiber Review (www.woodprices.com). Canadian exports also rose in 2012 to 1.5 million tons, but this increase was less than that seen in the US. During the 1Q/13, total pellet exports from North America reached a new record of over one million tons for the quarter. This can be compared to the annual shipments of 750,000 tons just four years ago. The United Kingdom continues to strengthen its claim as the primary destination for North American pellets with over two-thirds of the export volume from the US and Canada going to the UK in the 1Q/13. The story of Drax’s plans for its large power plant conversion from coal to biomass in Selby, England, continues to make news across North America. Drax Biomass, a new sister company to Drax Power, that will manage North American operations, announced the construction of two pellet plants earlier this spring in the US South which will be sending pellets to fuel the UK facility. Also, in Eastern Canada, pellet producer Rentech announced an off-take agreement with Drax Biomass, which will result in new investment in ports to increase pellet-loading capacity, and in rail transportation, along with the construction and operation of two pellet facilities themselves. The increase in pellet production in Western Canada has pushed sawdust prices upward the past few years, with 2013 prices being about 15 % higher than they were in 2010, as reported in the NAWFR. In the US South, where smaller logs from thinnings and treetops are commonly used for pellet manufacturing, there has not yet been any region-wide upward price pressure as a result of the new wood-consuming sector in the region.